View More In A-B Boxes. It's a well-known fact that running two amps is not only enormous fun, but also a time-honored way of achieving bigger tones on stage and in the studio. Whether it's switching between two different amplifiers for their individual characteristics (rhythm and lead, for example) or using them simultaneously for huge walls of sound, pros have been employing this setup for decades. Achieving this easily, however, has always been a problem for guitar players. Poor quality passive ABY boxes/line selectors load the guitar signal down, degrading the tone and rendering the whole exercise almost pointless. Not to mention ground hum issues caused by non-isolated outputs. On the other hand, active ABY pedals are in short supply and are usually quite cumbersome. Includes 3 Cables and a Geartree Cloth! Phase correction switch to address out of phase amps. 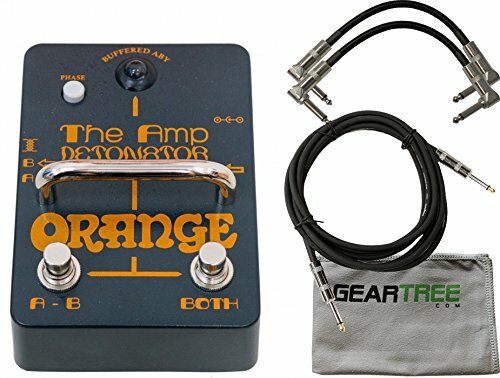 The Amp Detonator is the only active ABY switch that can be powered by a battery, 9V, or 12V power supply. Featuring silent operation, isolated outputs, phase switch, and individual footswitches all in a compact design.